How fast is the LO 440? 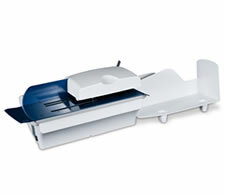 It can open a stack of 100 envelopes in under 15 seconds! Instead of tiresome envelope opening by hand or slower automatic machines, let the OL440 zip through envelope batches with smooth efficiency, leaving you time for other tasks. The LO 440 is renowned for long lasting, trouble-free operation, and even sharpens its own cutting blades if they get nicked by a staple or paper clip. Feeding: The large input hopper has three belts that help the machine adjust to different size envelopes on the fly. You place a big stack of mail in the hopper and let the OL440 do the rest automatically. Mixed-Size Processing: You don’t need to presort your envelopes by size before feeding. Just stack everything together, tap down on one edge to push contents away from the cutting side, and place the batch in the hopper. The LO 440 adapts to different sizes on the fly. Large Envelope Capability: The LO 440 ably handles envelopes up to 10”x14” and 3/8″ (10mm) thick. That includes most flats and heavy “overnight delivery” envelopes. Dual HSS Self-Sharpening Cutting Blades: Made from hardened high-speed steel, the blades are resistant to nicks from clips, and staples. They provide precise, full-length cutting, and are self-sharpening to extend longevity. Variable Cutting Width: You control how deep the blades cut into the envelopes to avoid damaging envelope contents.